2 Bedroom Semi Detached House For Sale in Stratford-upon-Avon for Guide Price £460,000. 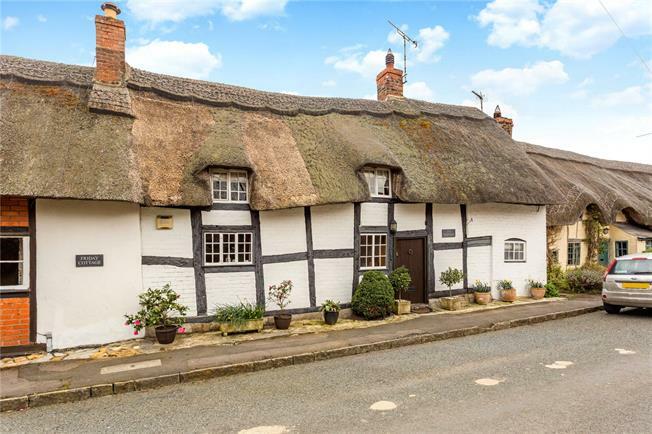 A classic, timber framed and thatched, Grade II Listed cottage, situated in the heart of this highly-favoured village with a delightful, well-tended garden. Upgraded over recent years this charming cottage now provides a sylish home with many character and contemporary features of note. Within the older part, the living room, with dining area, is awash with exposed timbers and features an oak floor, exposed stonework and a traditional inglenook fireplace with a flagged heath and wood-burning stove. A single storey extension at the rear now provides a versatile space currently used as a sitting/garden room, with oak floor and full-height glazing to the garden making full use of the southerly aspect. The kitchen is well-equipped with a range of built in appliances and there is a seperate utility room which houses the gas fired boiler (installed circa 2015). There are two double bedrooms on the first floor, accessed via separate staircases, both being full height and featuring exposed timbers; the principal bedroom is particularly noteworthy and has a magnificent ensuite bathroom adjoining, again being of full height with exposed timbers and complete with roll top bath. The second bedroom is served by a large shower room on the ground floor with underfloor heating. Pebworth is an attractive rural village, situated at the edge of the North Cotswolds, on the borders of South Warwickshire and Worcestershire. Local amenities include a village pub, a church and pre-school. A mini-supermarket and further facilities will be found in the nearby village of Mickleton (approx 3 miles) as well as Bidford-upon-Avon (approx. 4 miles). The property is well-placed for access to a number of larger conurbations including Stratford-upon-Avon (approx. 9 miles), and a mainline railway station in nearby Honeybourne (3 miles) provides a regular service to London, Paddington. The garden to the rear has been thoughfully laid out with a paved patio extending the full width. This adjoins the cottage with a small retaining wall and steps rise to a lawn with path to rear. A wall forms one boundary with herbaceous borders. At the rear of the garden, segregated by a low fence is a 6'x4' shed, 12'x6' workshop and the LPG storage tank. A private driveway across the rear of the adjoining properties provides rear vehicular access. Mains drains and electricity connected. LPG central heating. The property is rated band E for Council Tax resulting in a charge of £2153.36 for 2019/20.